The Bullitt Automotive (Local Car Rentals) is located at 274 Green Camp Road Wakerley Queensland. The Shocker Hitch Air Ride Towing Hitch provides the ultimate smooth ride. 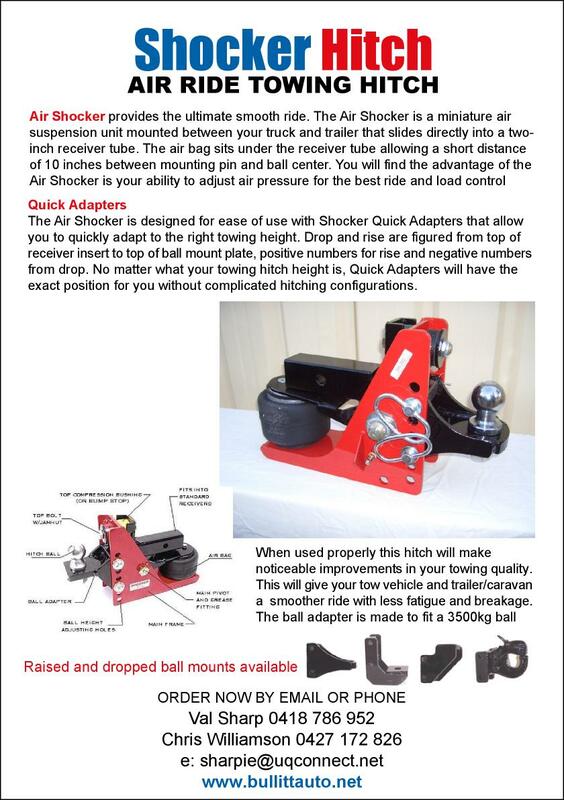 The Air Shocker is a minature air suspension unit mounted between your truck and trailer that slides directly into a two inch receiver tube. Click here to see the full flyer. Telephone: 07 3245 6199 or 0418 786 952; or Online: Click Submit Enquiry button on the right. Please let the company know that you have seen their photos on Caravan Park Photos. Photos on this page were supplied by Bullitt Automotive Pty Ltd on the May 2010. *** For more information, photos and resources visit the Bullitt Automotive Pty Ltd website.